I thought this a brilliant idea and jumped at the chance to not cook and cook and cook–for just the two of us–on Christmas Day. The thought of waking leisurely, sipping on coffee and luxuriously reading the New York Times while sitting in front of a fire instantly melted my heart. Yes, this is something I can do and do well. At least one day this year. And so it was–the Christmas holiday that I did not slave over the stove, oven or stand at the counter chopping, dicing and pureeing. Instead, we brunched at home and sipped a festive mimosa. Or two. Because we were laying low for the holiday eating regime, we did agree that, as is always the case with us, dessert was mandatory and I set out to find something suitable for the occasion. Anything bad for you was out of the question, since that would negate the concept of not stuffing ourselves silly. But tasteless was also unacceptable. The pecan crust I made during the Thanksgiving celebration was a winner and that was the foundation on which everything else came to be. I found this gluten and grain-free recipe for a crust on Elana’s Pantry. Subsequently, she shared that she filled this perfect crust with apples and won her family over, so I figured it was also good enough for us on this special occasion of our non-gluttonous holiday of eating. 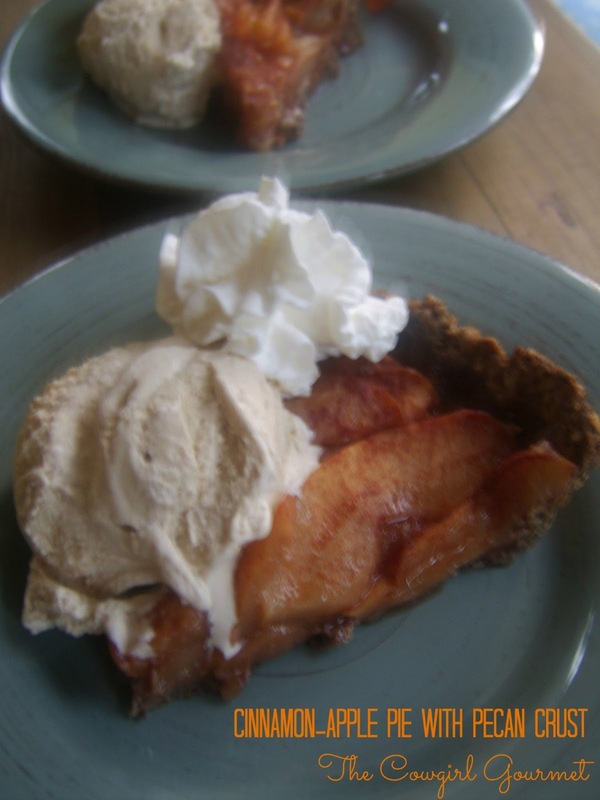 Considering it was so healthy, I suggested homemade ice cream to up the ante and David suggested cinnamon would be a lovely partner to our apple pie. And it was. Sinful, but without the guilt–just pure, healthy deliciousness. Don't let the gluten and grain-free labels fool you. This pie is anything but bland and boring. The cinnamon and fresh apples mixed with the flavorful pecan crust make this pie special enough for any occasion as well as healthy enough for everyday. If you want the recipe for the pie crust, get it here. You may want to make the cinnamon ice cream for special occasions only. Or not. If you love cinnamon, this is the real deal. Steeping the milk and cream with cinnamon sticks and then adding ground cinnamon gives this ice cream a rich flavor that is not overpowering but absolutely spot on fantastic. Pie crust recipe For this pie crust, I added 1 1/2 tablespoons of brown sugar to the crust just to inject a touch of sweetness. In a large bowl, toss the partially peeled apple slices with the lemon juice and then add arrowroot, honey, cinnamon and a pinch of salt. Fan apples out top of the uncooked pecan crust in a circle and its center. Keep layering until all of the apples are used. Cover pie with foil and bake at 350 degrees for 45-70 minutes or until juices are bubbling. Once bubbles appear, remove the foil and cook uncovered for 5-10 minutes longer. Serve with whipped cream, whipped coconut cream or cinnamon ice cream (recipe below). Combine milk, cream, sugar and salt in a medium saucepan and place over medium-high heat. Stir to combine and add cinnamon sticks and bring to a simmer. Stir constantly so the sugar dissolves and the milk does not stick to the bottom of the saucepan. This will take about 10 minutes. Remove from the heat. In a big bowl, whisk the egg yolks until smooth. Slowly whisk in 1 cup of the cream mixture into the yolks, stirring constantly so the warm cream does not scramble the eggs. Gradually whisk in the remaining hot milk mixture and then return it all back to saucepan. Place over medium heat and stir constantly until custard thickens enough to coat a wooden spoon. You do not want the custard to boil. This will take about 5 minutes. While stirring, add the ground cinnamon and vanilla. You may need to use the whisk to break up any clumps of cinnamon. Once the custard is thickened, remove from the heat and prepare an ice water bath by filling a large bowl halfway with ice and water. You will also want to use a strainer or a sieve to pour the custard through so you can remove the cinnamon sticks and any remaining clumps of egg. Using the sieve, pour the custard into a bowl that will fit into the ice bath and set the bowl over the ice bath to cool to room temperature. This will take about 15-20 minutes. Stir occasionally.Using the sieve, pour the custard into a bowl that will fit into the ice bath and set the bowl over the ice bath to cool to room temperature. This will take about 15-20 minutes. Stir occasionally. Remove the ice cream base from the ice bath, cover and place in the refrigerator to chill thoroughly, at the least 4-5 hours but preferably overnight. Freeze in an ice cream maker according to the manufacturer's instructions. Place ice cream in an airtight container in the freezer to allow to harden. When ready to serve, allow to soften on the counter for about 10 minutes. Everything about this recipe looks amazing. I can't wait to try it out.